The words we speak tell a lot about the condition of our soul. Jesus said, “For the mouth speaks what the heart is full of. A good man brings good things out of the good stored up in him, and an evil man brings evil things out of the evil stored up in him. But I tell you that everyone will have to give account on the day of judgment for every empty word they have spoken. For by your words you will be acquitted, and by your words you will be condemned.” (Matt. 12:34-37) What we really believe will come out in the words we speak. James also spoke on the importance of our words, “We all stumble in many ways. 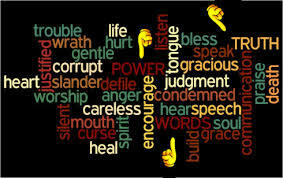 If anyone is never at fault in what he says, he is a perfect man, able to keep his whole body in check.” (James 3:2) He goes on to say, “The tongue also is a fire, a world of evil among the parts of the body. It corrupts the whole person, sets the whole course of his life on fire, and is itself set on fire by hell. All kinds of animals, birds, reptiles and creatures of the sea are being tamed and have been tamed by man, but no man can tame the tongue. It is a restless evil, full of deadly poison.” (3:6-8) If we cannot control our tongues, then it goes without saying that only the indwelling Spirit is able to do so, as we surrender to His empowering grace. Our part is to give Him something to work with. He cannot pull out of us what isn’t there. As we spend time meditating on God’s Word our minds are renewed; our minds are a part of our soul. When His Word is within us, Holy Spirit can and will bring it out of us when needed and we will speak that which is in agreement with Him. In addition, He gives us the fruit of self-control, enabling us to hold our tongues. Paul instructed believers, “Do not let any unwholesome talk come out of your mouths, but only what is helpful for building others up according to their needs, that it may benefit those who listen.” (Eph. 4:29) He is implying this is fully possible, but it takes the power of the Spirit to help us. A good challenge would be to take a day or two and really listen to what comes out of your mouth. The Lord has had me do this on several occasions, and it was very enlightening! When we learn to tame our tongues, we will be fully mature, according to the passage in James. God has given us everything we need in order to live this life He has called us to. The question is, are we using it?